Hey party peeps! Did you guys see the Grinch movie yet? Part of our holiday tradition is watching the Grinch with the kids. 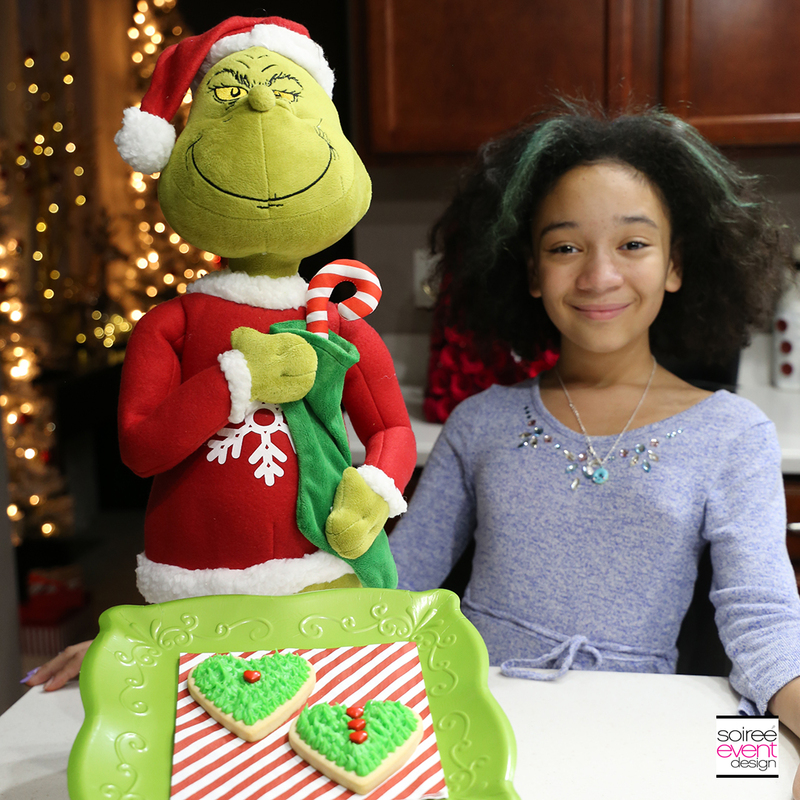 This year, I came up with a few easy to make GRINCH DESSERT IDEAS including Grinch Fingers Pretzel Rods, Grinch Heart Cookies and Grinch Heart Cookie Sandwiches. We whipped these up then enjoy them as we watch the movie. 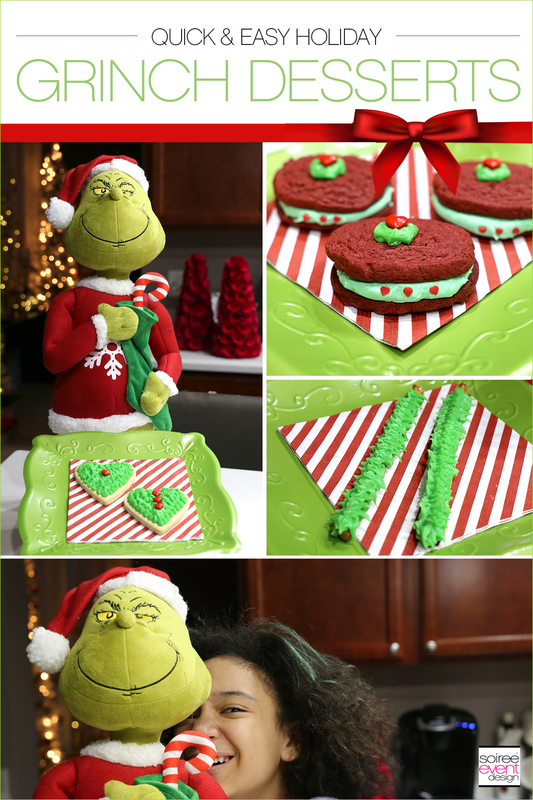 CHECK OUT THESE EASY TO MAKE GRINCH DESSERT IDEAS! 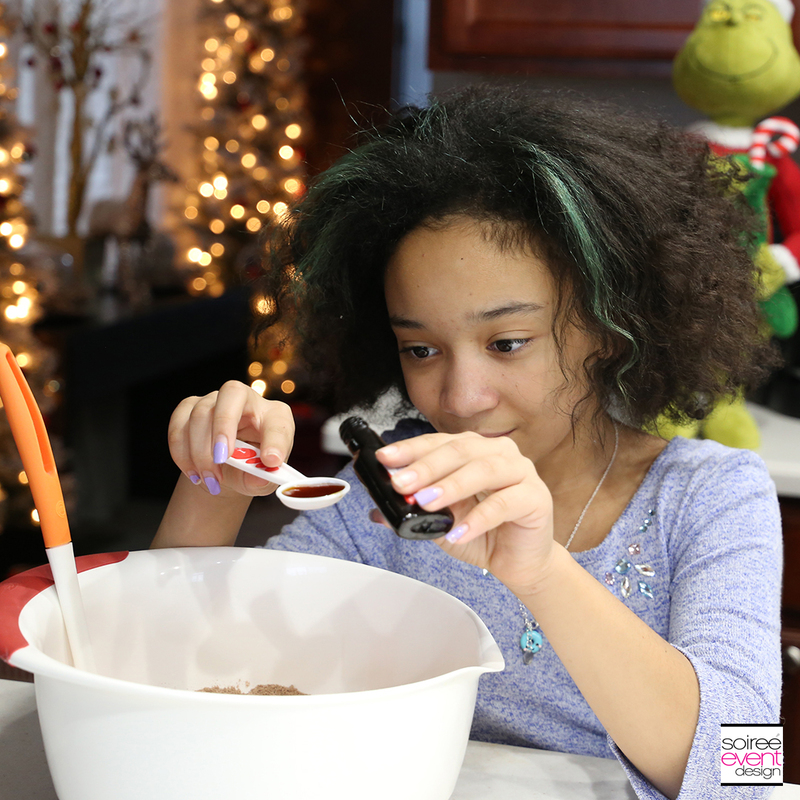 No matter how busy the holiday season gets, one thing that I always do is make time to bake sweet treats with my kids. It’s a great bonding time and we love it. But I don’t want to make everything from scratch! Mama ain’t got time for that! Sorry to all my baking friends. You all ROCK! 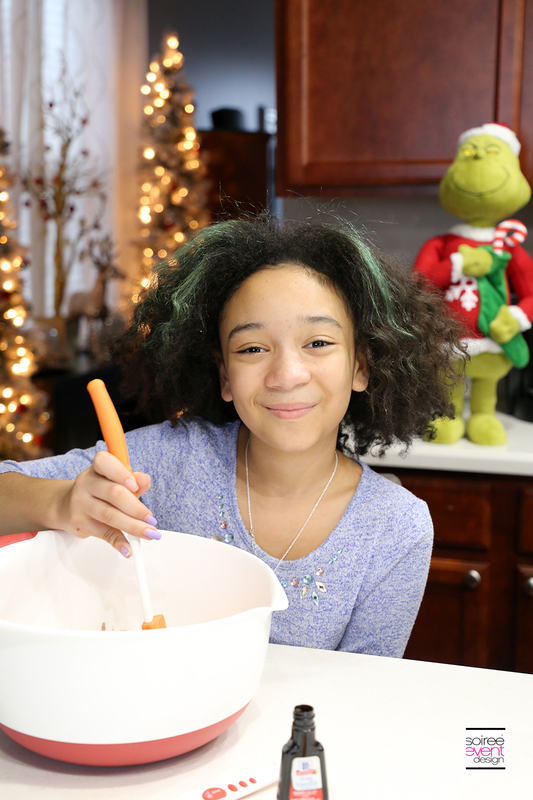 Riley is the little baker in the house. In fact, she wants to own her own bakery when she grows up! Gotta love a little entrepreneur in the making! 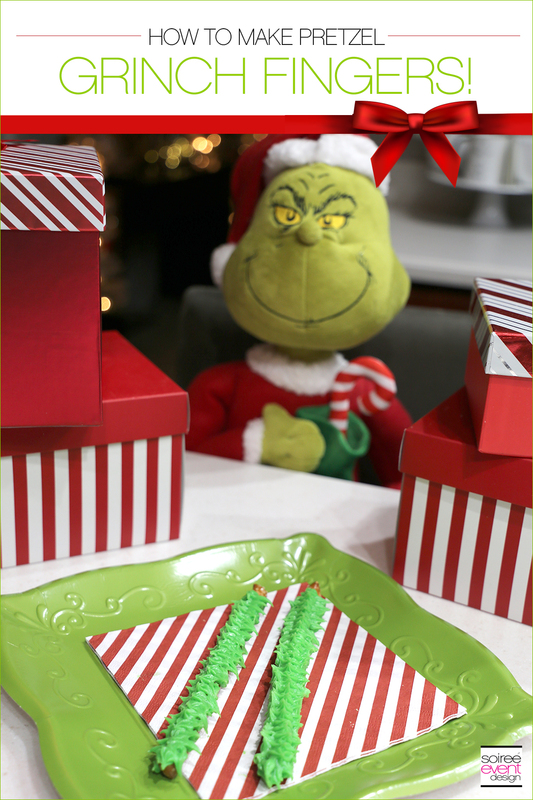 Want to whip up these Grinch Dessert Ideas? Let’s get started! 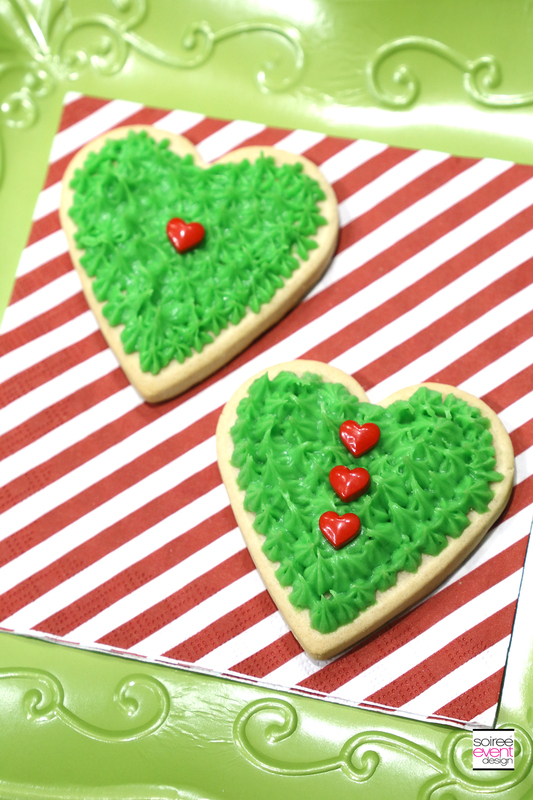 GRINCH DESSERT IDEAS – GRINCH HEART COOKIES! 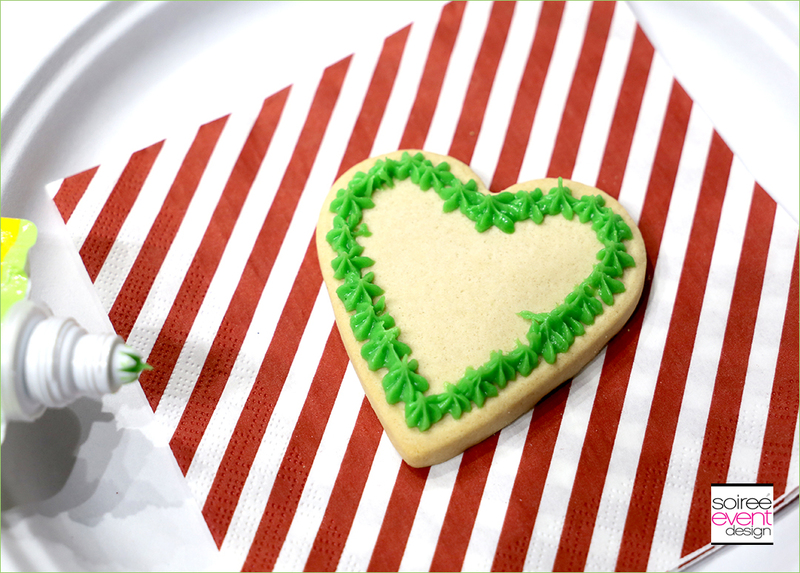 STEP 1: Let’s start with store-bought heart-shaped sugar cookies, shall we? 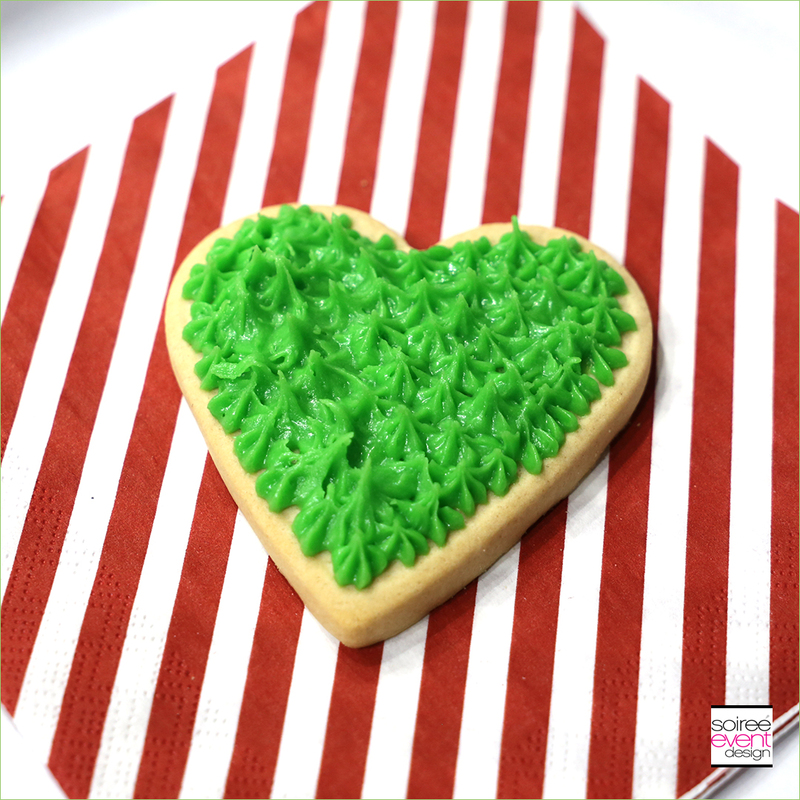 Then using Wilton tube green icing and the included star tip, create little peaks around the entire edge of the heart cookie. 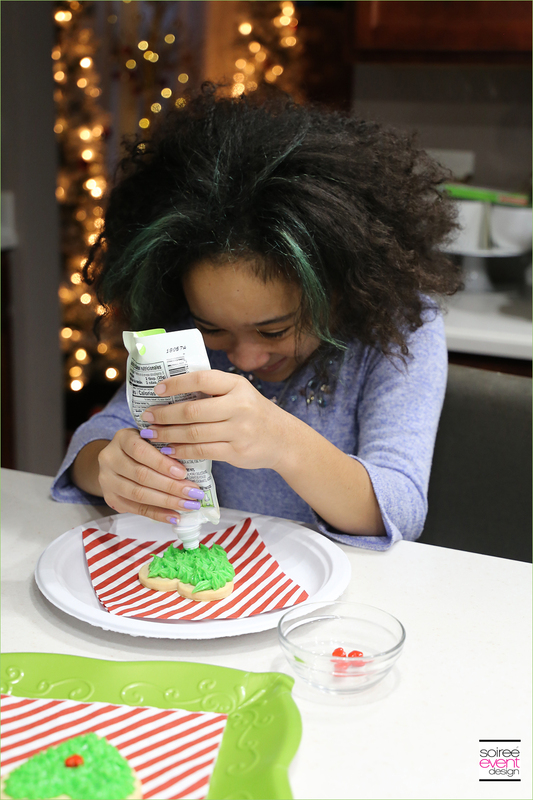 STEP 2: Fill in the rest of the cookie with the green icing. 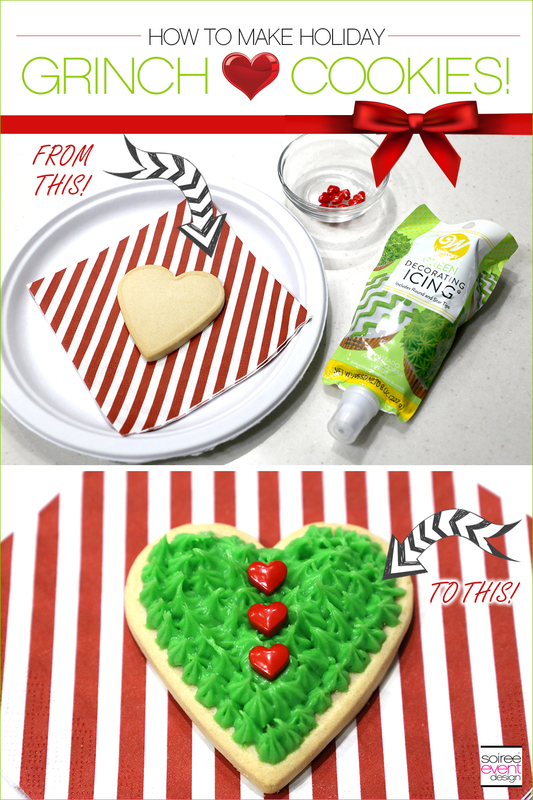 STEP 3: Place a red candy heart on the middle of the cookie. 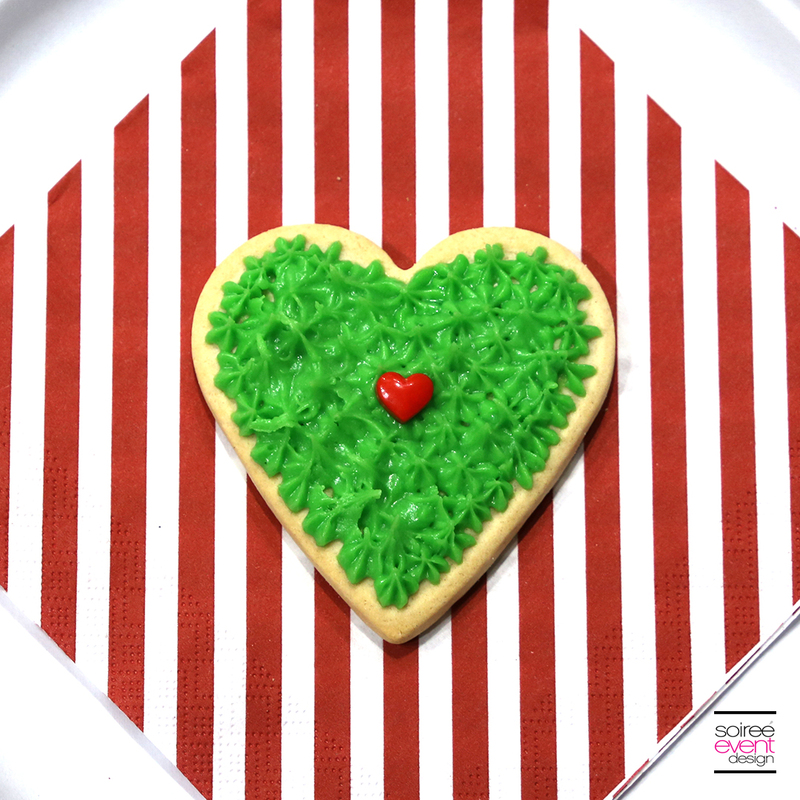 One of my favorite lines in the Grinch movie talks about the Grinch’s heart growing three sizes so in honor of that, place three red candy hearts on a few of the cookies too. These would be great served at a party or place one in a cellophane bag, tie the top with a bow and give as a gift. 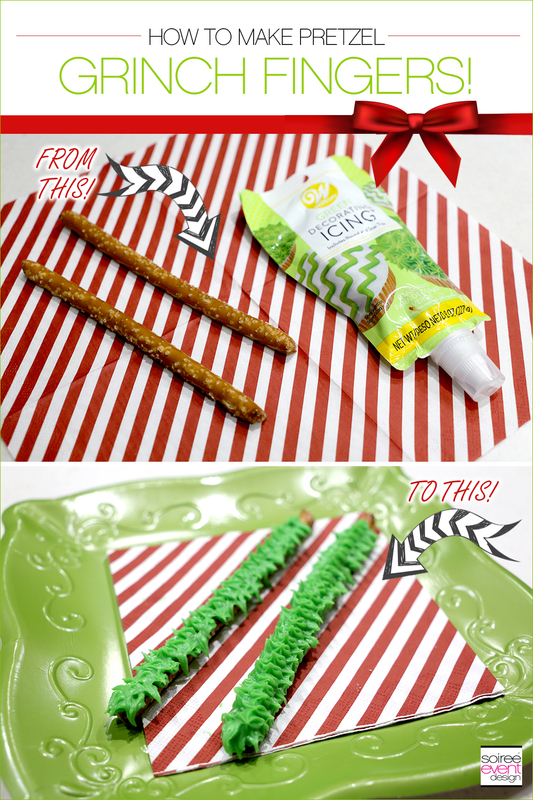 GRINCH DESSERT IDEAS – GRINCH FINGERS PRETZEL RODS! 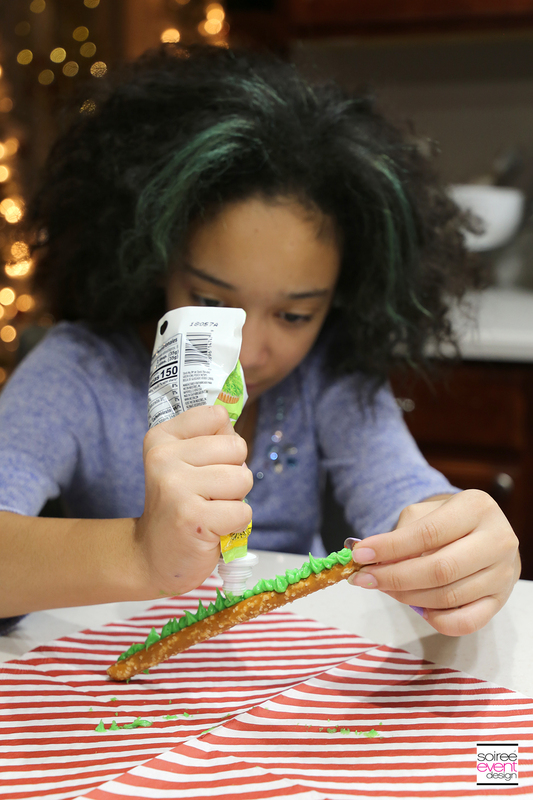 STEP 1: The best thing about these Grinch Fingers Pretzel Rods is that there is only ONE STEP! OH YEAH! 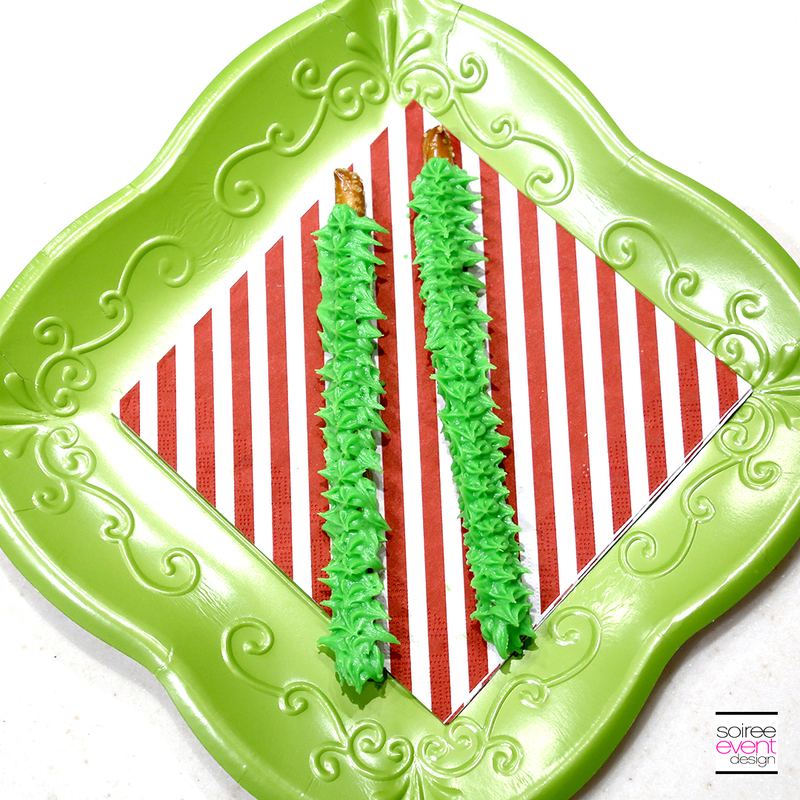 Simply use the Wilton green icing tube with the star tip to cover the pretzel rod. Easy enough for kids to do at a party! Don’t they look like Grinch fingers? 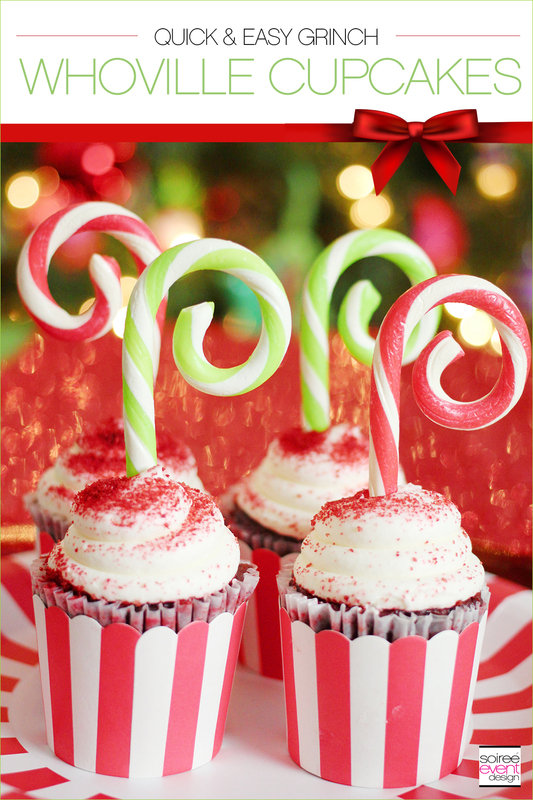 GRINCH DESSERT IDEAS – NO-BAKE WHOVILLE CUPCAKES! 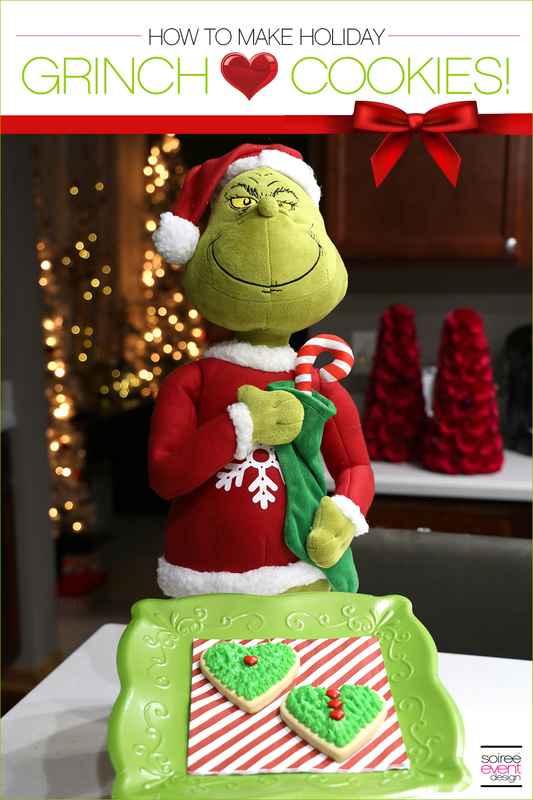 Looking for a quick and easy Grinch dessert idea? Well, it doesn’t get any easier than this! 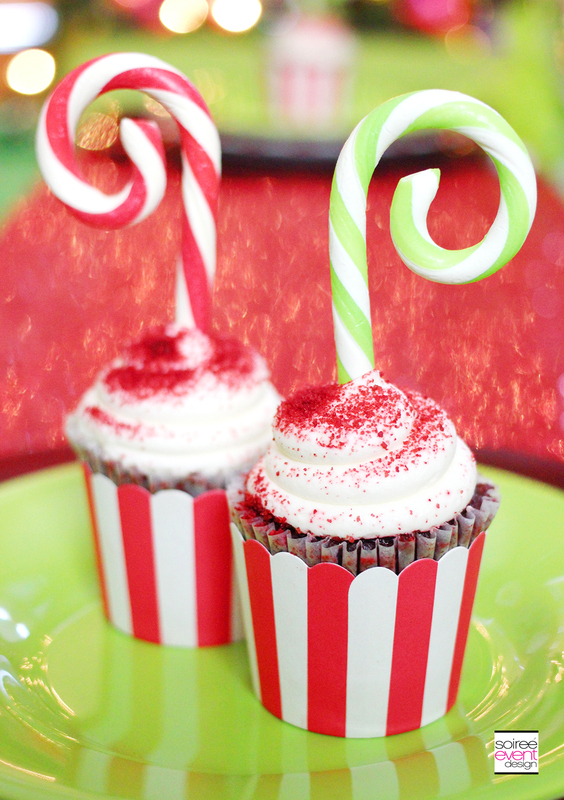 Simply place a curly top candy cane down inside a store-bought red velvet cupcake. Place the cupcakes into striped baking cups and DONE! How amazing do these look? 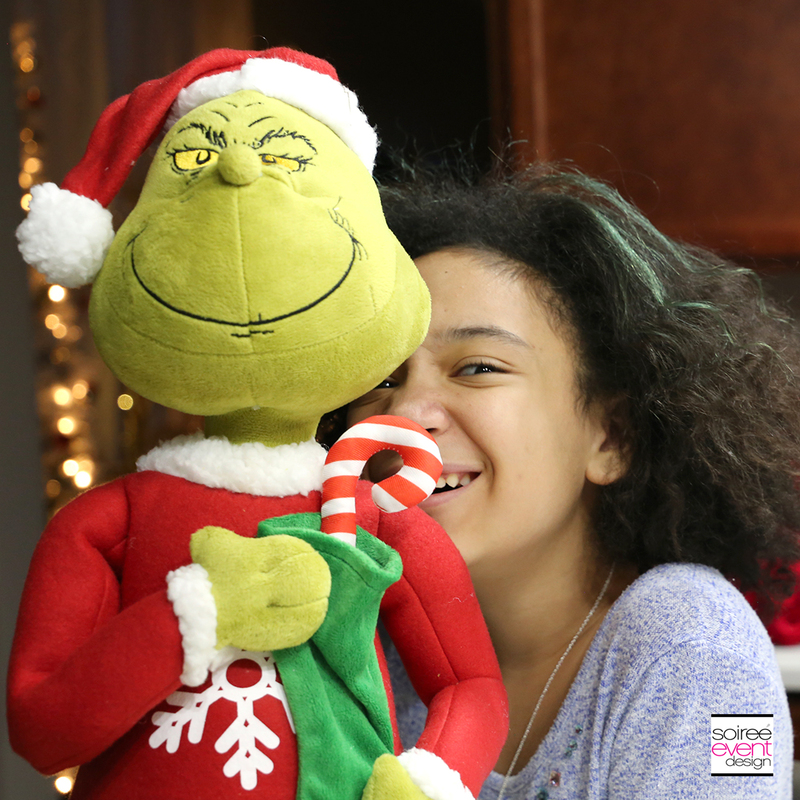 You will look like a total holiday rock star when you walk into a party or classroom with these babies! 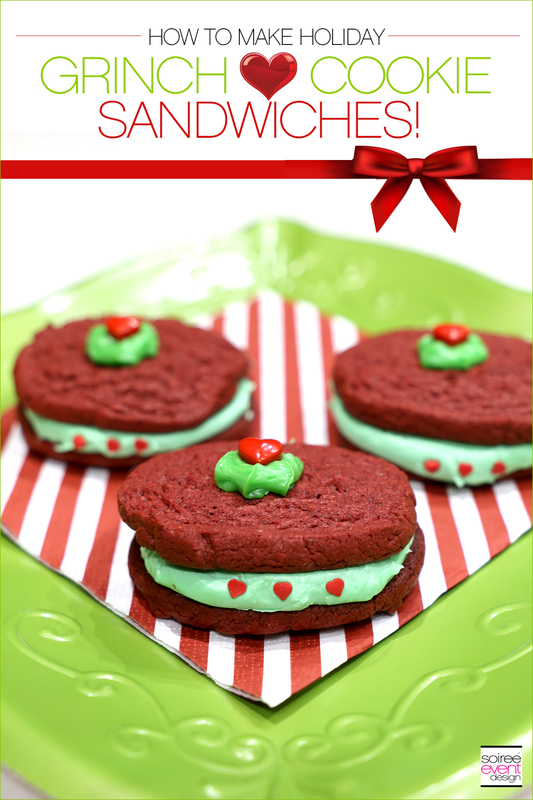 GRINCH DESSERT IDEAS – GRINCH HEART COOKIE SANDWICHES! GIRLFRIEND TIP: Just a heads up that the dough will need to sit in the refrigerator for a minimum of an hour, so plan ahead. I didn’t realize that when we made these, so Riley gave me the side-eye when she had to wait an hour to actually bake the cookies! Oops, MOMMY FAIL! 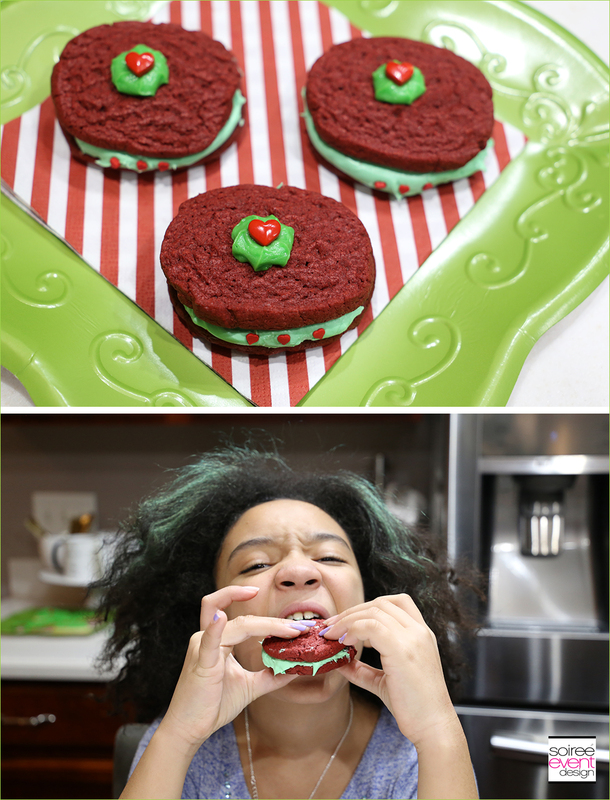 Now, these Grinch Heart Cookie Sandwiches are Riley’s favorites to make since it included actually BAKING! 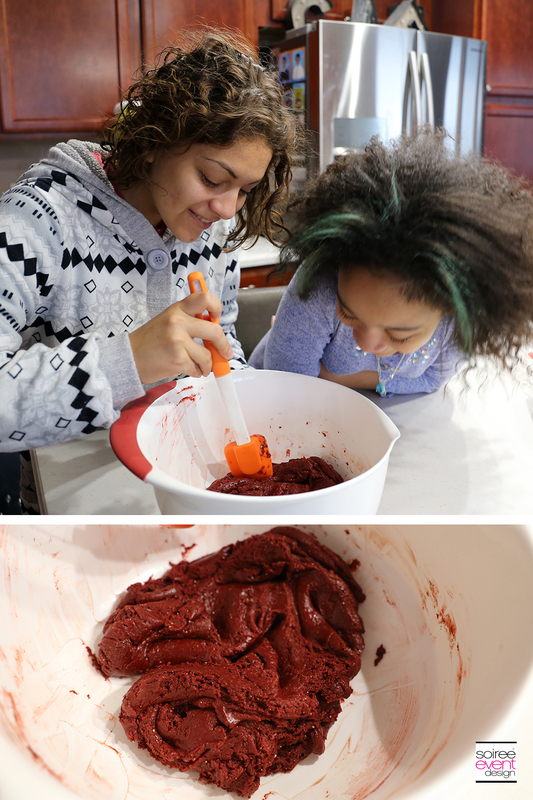 But we did start with a store-bought red velvet cake mix! YUP! Let’s get started! 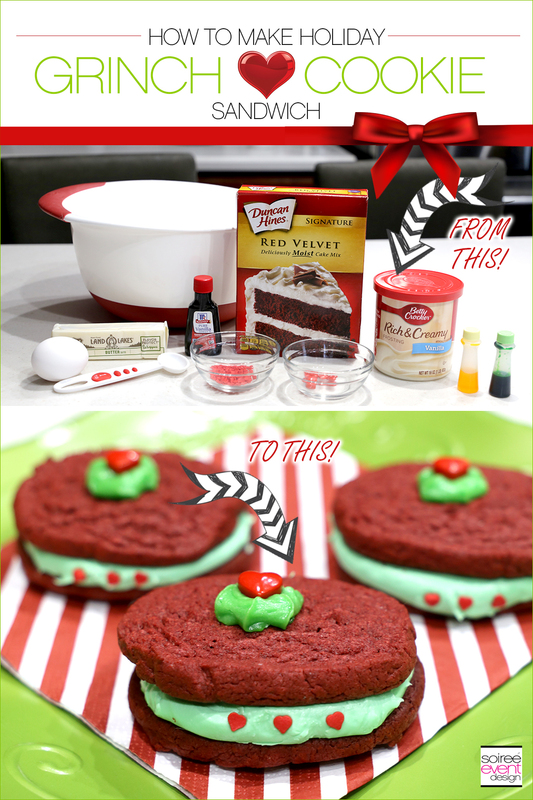 STEP 1: Put the entire box of red velvet cake mix into a large mixing bowl. 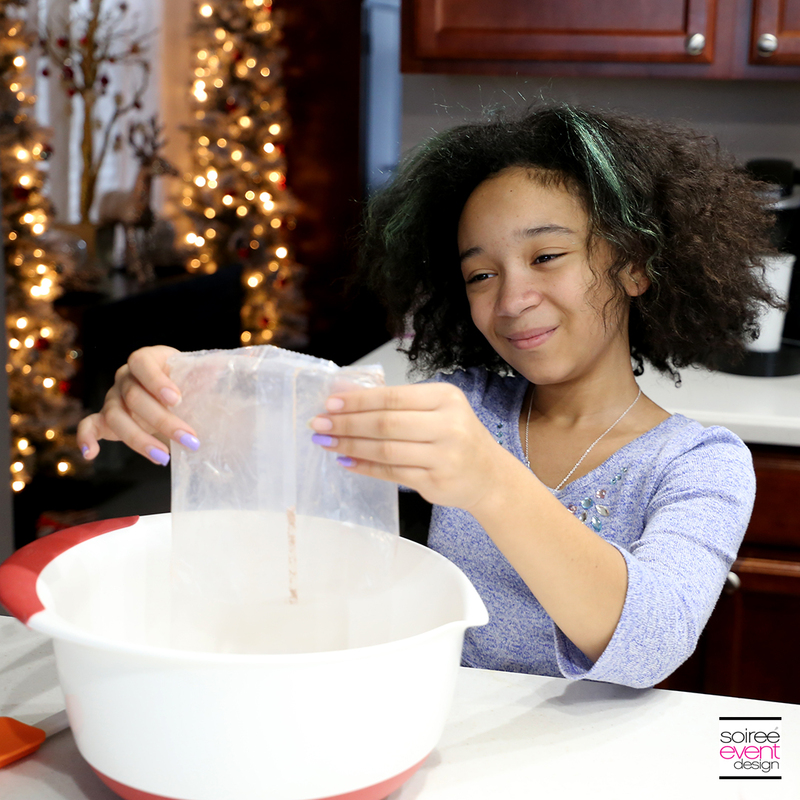 STEP 2: Add 1 tsp of vanilla. STEP 3: Add one stick of melted butter that has cooled. 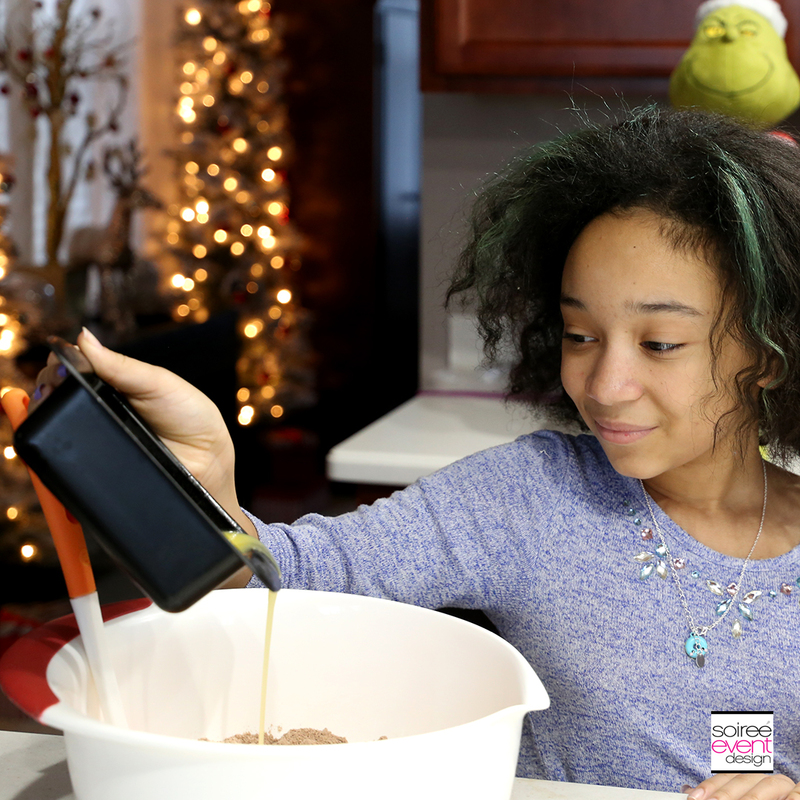 STEP 4: Mix by hand until the mixture becomes a dough consistency. 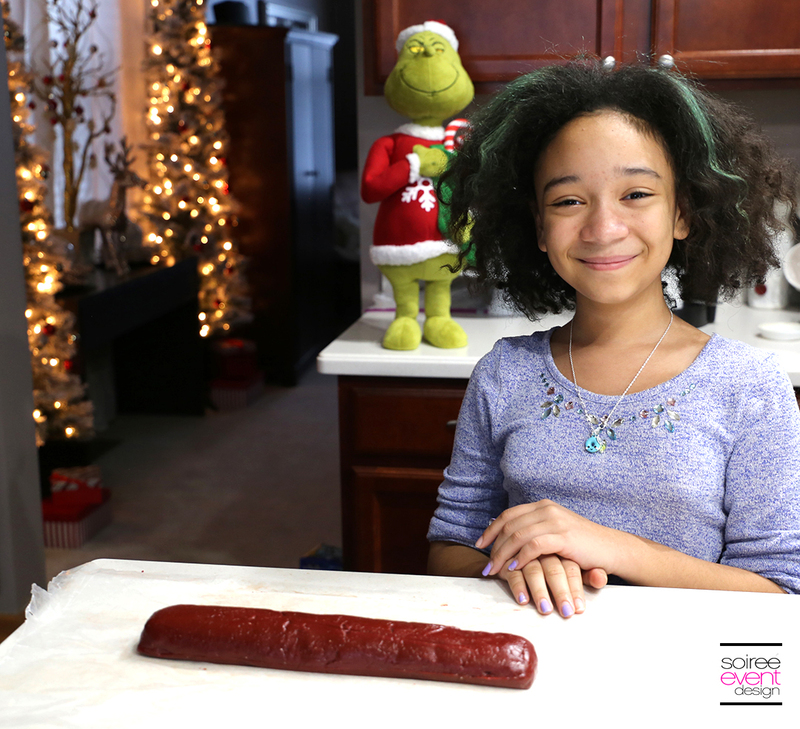 STEP 5: Place the dough on a piece of wax paper and roll it to form a log about 11 inches long. Wrap the log in the wax paper and cover it fully with cling wrap. Place in the fridge for at least one hour. STEP 6: Preheat the oven to 350 degrees. Remove the log from the fridge and unwrap the dough and place it on a piece of wax paper. 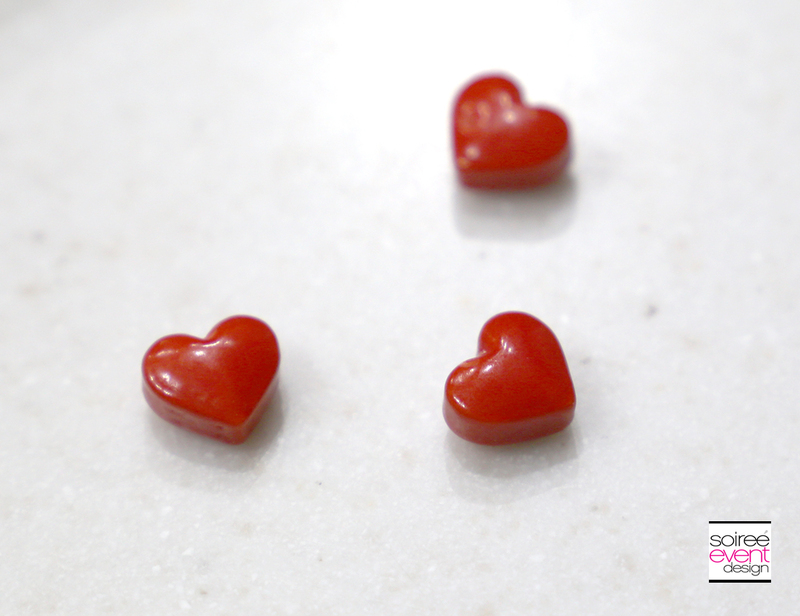 Cut the dough into 1 inch pieces and place on baking sheets in pairs. Bake for 10 minutes. Remove from the oven and let cool on the pan for about 5 minutes. Then move them to a wire rack to cool off fully. STEP 7: Now it’s time to tint the vanilla icing green. 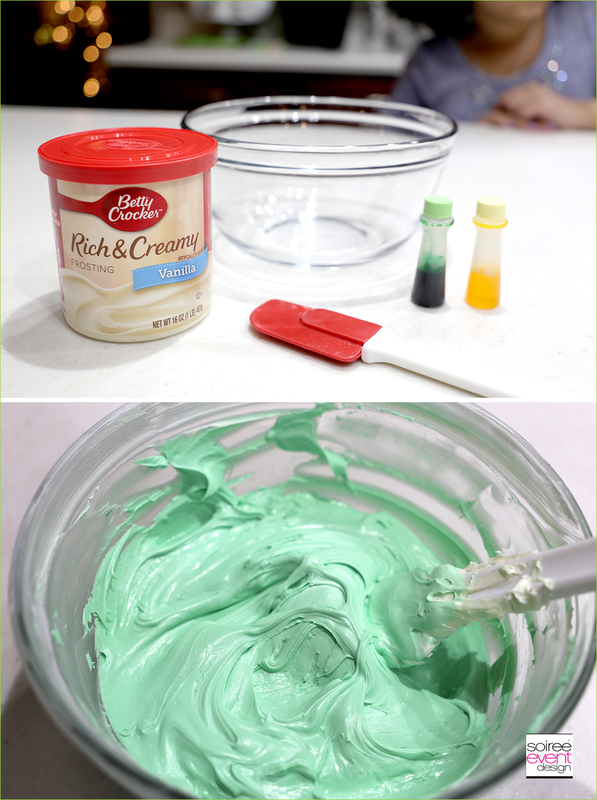 Place the entire tub of vanilla icing into a mixing bowl and add green food coloring and mix until you get the desired green color. 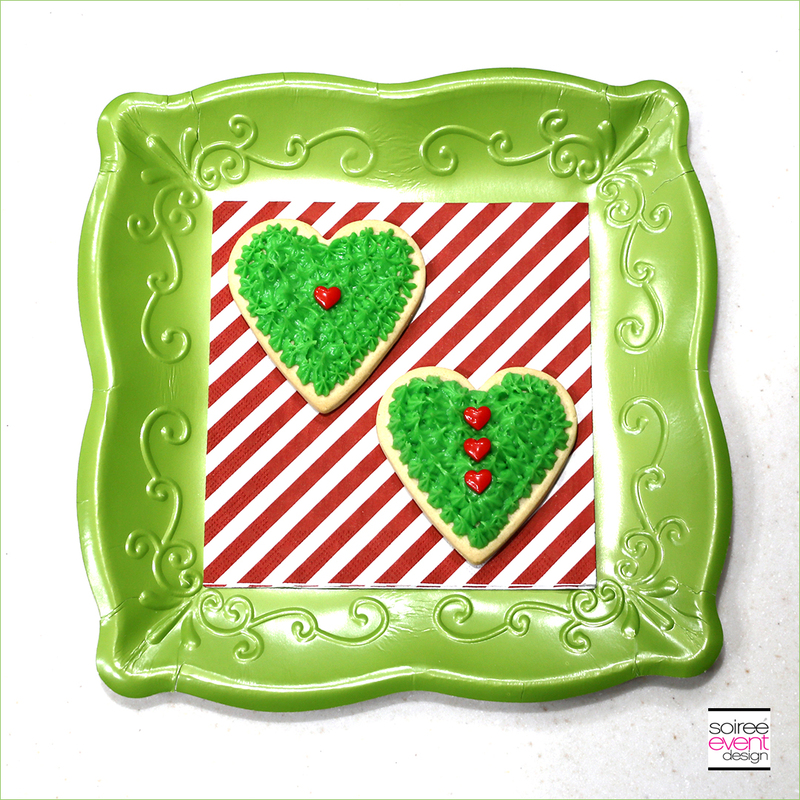 STEP 8: Once the cookies have fully cooled, place some green icing in the middle of one of the cookies. 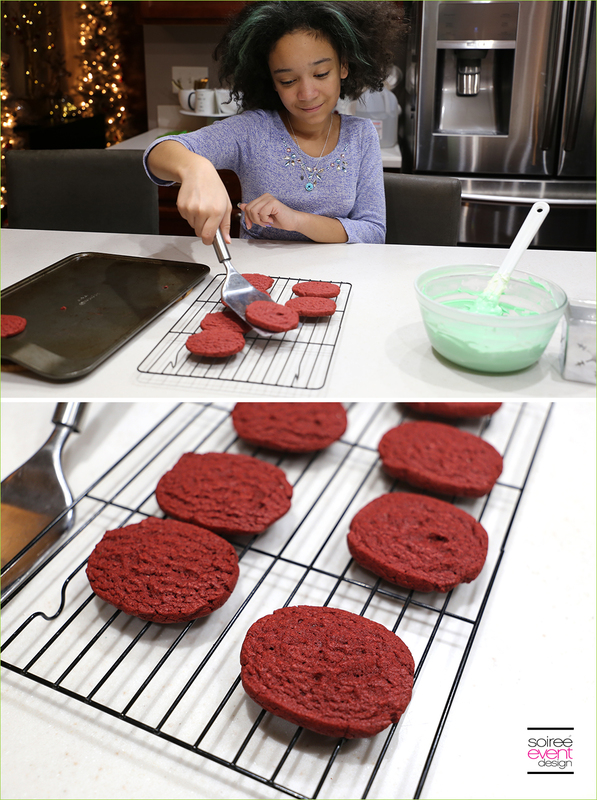 Then top it with another cookie and squeeze gently until the icing reaches the edges of the cookie. 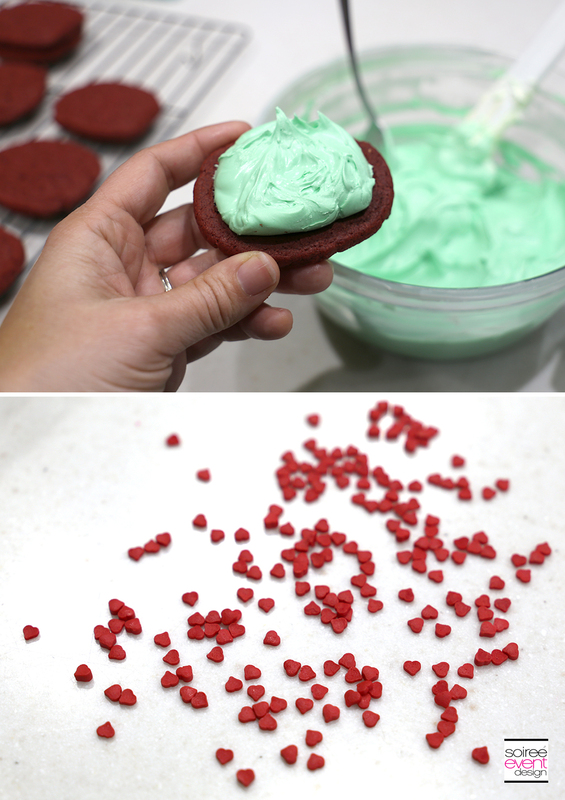 STEP 11: Place three red heart sprinkles on the green icing and squeeze a small bit of icing on the top of the cookie and add a red candy heart on top of it. ALL DONE! NOW ENJOY! 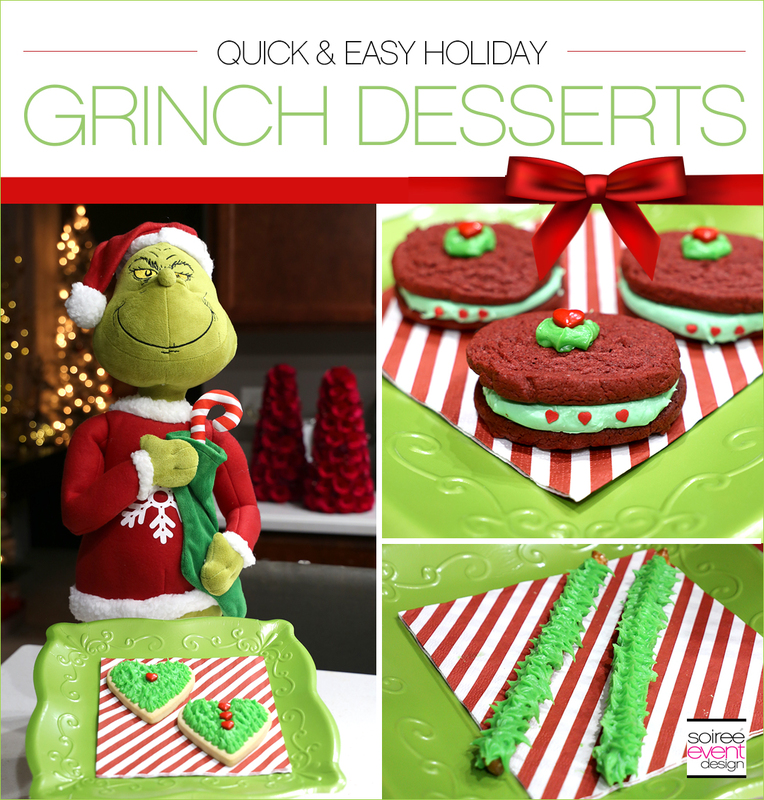 GRINCH PRINTABLE DESSERT TAGS AND CUPCAKE TOPPERS? 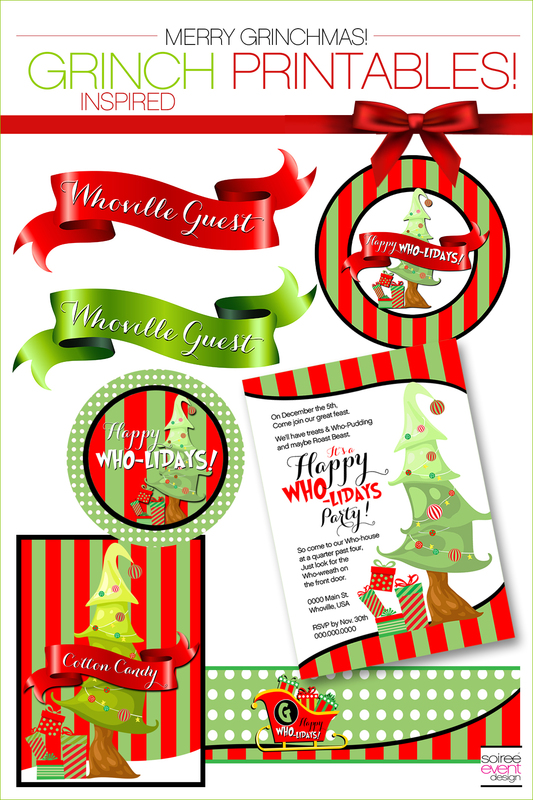 Check out my Happy Wholidays printable collection that includes customized printable dessert tags to match your dessert names. The collection also features printable cupcake toppers that you use on the Whoville Cupcakes instead of the candy canes if you can’t find those.